We've had snow all weekend, but none of it stuck until yesterday (though friends further out did have a couple of inches stick). The schools opened late (not sure why) and then it started snowing, so they closed early. Gareth ran out to play in the snow yesterday, but came back in about five minutes later saying there wasn't enough to build a snowman with. And he was right - there was probably less than a quarter inch. A few hours later the sun came out and most of what had stuck melted. But the snow started up again during the night and we woke up this morning to a couple of inches. Gareth was very excited to go out and help me shovel. Maybe one day he'll learn that the snow on the grass doesn't need shoveling and that we want to put shoveled snow on the grass areas, not the areas I already shoveled. Overall, he did a pretty decent job though. 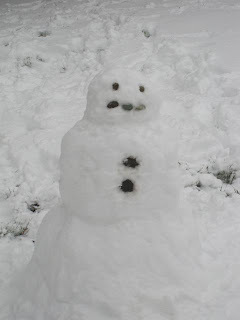 Then this afternoon we went outside and built his first snowman (well, I built it, but he did shovel some snow over to me once in a while and helped put in the stones for it's face and buttons). He really doesn't have mittens conducive to playing in snow, so it was best for me to do it anyway. I couldn't be bothered to find sticks for arms. It's a pretty small snowman, but a good size for a little kid. I'd forgotten how exhausting making a snowman can be! At least we can make them here, though. In Indiana I could never get the snow to pack. Growing up I remember being able to make a small ball and then just roll it in the snow to make it larger. That method didn't work so well today, but maybe I'm just out of practice. Gareth was very pleased with it and didn't seem to notice that it has no arms, for which I was very grateful.